We moved to Pennsylvania almost 40 years ago and I discovered that the local tradition at Christmas is making a wide variety of cookies. Where I grew up in south Arkansas, we would make pies and cakes but I did not know about the Christmas cookie tradition. However, I gladly embraced the Christmas cookie tradition and have made a multitude of cookies since those first Christmases in Pennsylvania. My cookie making begins early in December when I make several types of dough and place in refrigerator. Then as I have time, I will bake several batches, place in tightly sealed tin can and make sure they are out of sight until closer to Christmas. 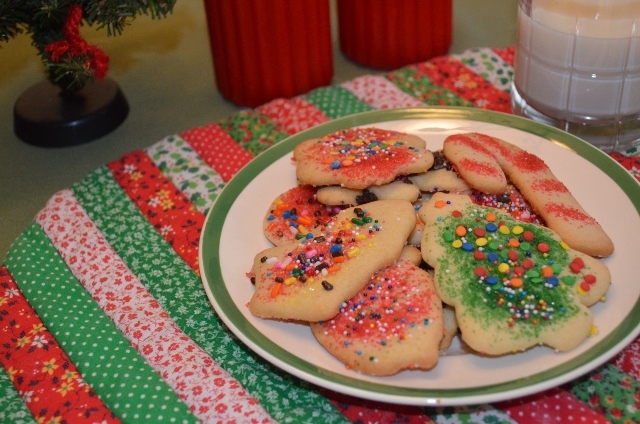 The most basic Christmas cookie is the sugar cookie or cut-out cookie. I am not very fancy with my decorations – just a few shakes of colored sprinkles. I used to rope the kids into helping with the cookie decorating but quickly tired of decorating. I usually cut the recipe below in half since I have a lot of different cookies. Use parchment paper on the cookie sheets for ease in removing the cookies and quick clean-up. When baking a lot of cookies (or even small batches) parchment paper will make your life much easier – I finally started using it and it makes a big difference! 1. Sift together the flour, soda and salt. Cream together butter, shortening, sugar and vanilla. Add egg; cream until the mixture is fluffy. 2. Stir in dry ingredients until mixture is smooth; blend in milk. 3. Roll out and cut with cookie cutters; decorate. 4. Bake in a 350 degree oven for 8 – 10 minutes or until lightly browned around the edges.